Loesje Jacob helps people to tune into nature, animals, other people and themselves. 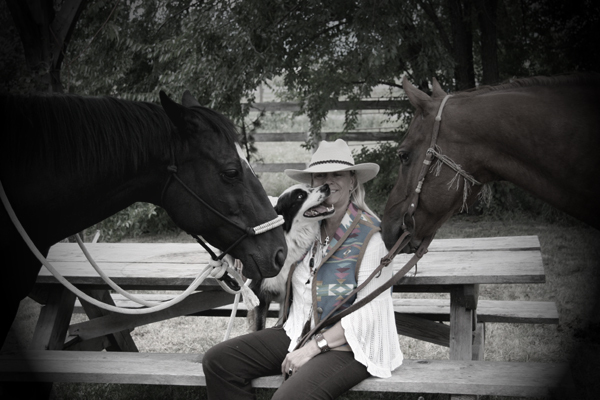 Join her on a horseback journey of healing and self-discovery in September in the Canadian Rockies. Loesje Jacob loves animals and people. As an advanced instructor of BodyTalk and BodyTalk for Animals, a consciousness-based, non-diagnostic therapy that works with the body in its healing process, she travels the world teaching people how to communicate with themselves, with others and with animals. “They call me the one who listens to the animals,” she says. Vets send her animals they are having trouble diagnosing and treating. She also works with children and young people who are struggling, including those considered hyperactive or autistic. Lately she has been drawn to work with orphans. She loves to be outdoors in nature. She has taken groups of young people from around the world to share healing techniques with orphanage children in Indonesia, as well as remote communities throughout Canada. Born in Holland, she moved to Canada as a girl. She spent a lot of time in nature playing and watching horses at the stables. Now she is based in the Okanagan Valley, BC. Jacob worked with a vet in Montreal who was practicing integrative medicine and was deeply inspired after reading a book by Karen Pryor, Don’t Shoot the Dog. Pryor was a dolphin trainer who used positive reinforcement and taught that there was a better way. Jacob built a business based on dealing with on aggressive and fearful animals. She is developing her own program called Linking Awareness: Intercellular Communication, A healing Journey, which teaches people to communicate non-verbally with other living things as well as to experience a self-healing process. Animals are non-verbal teachers, she says. We hold this potential too. Horses are herd animals that communicate by body language, as well as a non-verbal frequencies. Loesje calls them “land dolphins.” To listen to animals you need to use your subtle senses, a form of inner knowing. Linking Awareness develops awareness of our subtle senses that animals understand. You can take this ability to a business meeting. Join Loesje on an Adventure in Linking Awareness. Tommy Europe: Make a plan. Follow it. No excuses.